Glamorous Girl 2014: I'm Back! I'm finally home from vacation (I know I was gone for so long)! Instead of staying an extra week with my mom and sister, I decided to drive back home with my dad and our dog. Overall vacation was a blast and I'm definitely going to do a post to share all of my lovely Michigan vacation pictures with you all, but for now here's a photo of my best friend and I tandem biking on Mackinac Island, Michigan. 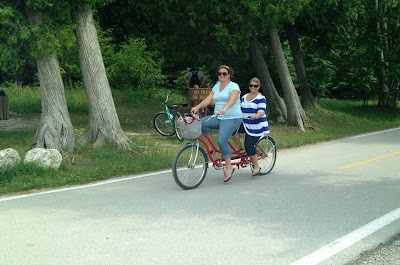 We had such a great time and we can now cross tandem biking off of our bucket lists! I'm off to get some more sleep, Dad and I drove straight through from Michigan to Florida. Very exhausting, yet extremely fun! Yes, I'm aware we're insane. Hope you all have been well. I'll be back to normal blogging this week. Loads of love!